A lax deciduous twiner with green or (very) glaucous stems and leaves. Pale yellow flowers, often marked purplish outside on penduncled spikes. The unscented flowers appear in May and continue into June. Clusters of yellow and orange berries in the autumn. Native of central North America. Grape honeysuckle or moonvine honeysuckle prefer normal garden soil and full sun. In shade the plant poorly flowers. 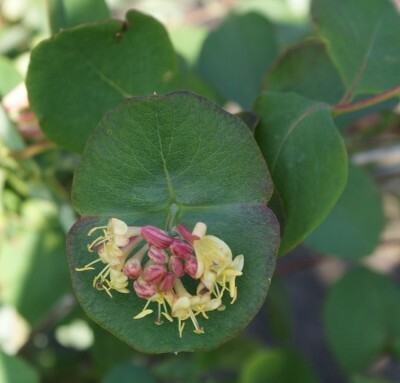 It has very glaucous leaves that contribute to the plant’s ornamental quality. Upper leaves are united at their bases, in eucalyptus fashion. Clusters of unusual yellow flowers appear in May and June. Usually twining, but in open situations may develop a shrub-like growth habit.